Most of us have been taught, at a young age, to mind our manners. No elbows on the table… Feet off the couch… Chew with your mouth closed. These are some phrases we have all likely heard as children. As we are all slowly transitioning into adult-hood, it is time we learn proper etiquette. We may not be sitting with Prince William for dinner, but if we had the chance would our etiquette be appropriate? Proper etiquette is viewed as a form of politeness, but etiquette is not simply about which side the fork goes on …(it’s the left). When networking, you do not want to be the one discussing what level of Trivia Crack you are on. Update yourself on current events and on issues within the companies you plan on talking to. Networking can be more than finding friends in your career field, it could be a potential job interview, or a way to find a mentor. The connections you make through networking will be beneficial to you in your present or future career. Networking is something that should begin early, and will continue throughout your career and personal lives. Building upon your professional development is always a positive career choice and networking is a large part of that development. Learning from other people in your field is a way to share ideas and come together as a community. Overall, network every chance you get; Do not pass up on opportunities to advance yourself as a professional. 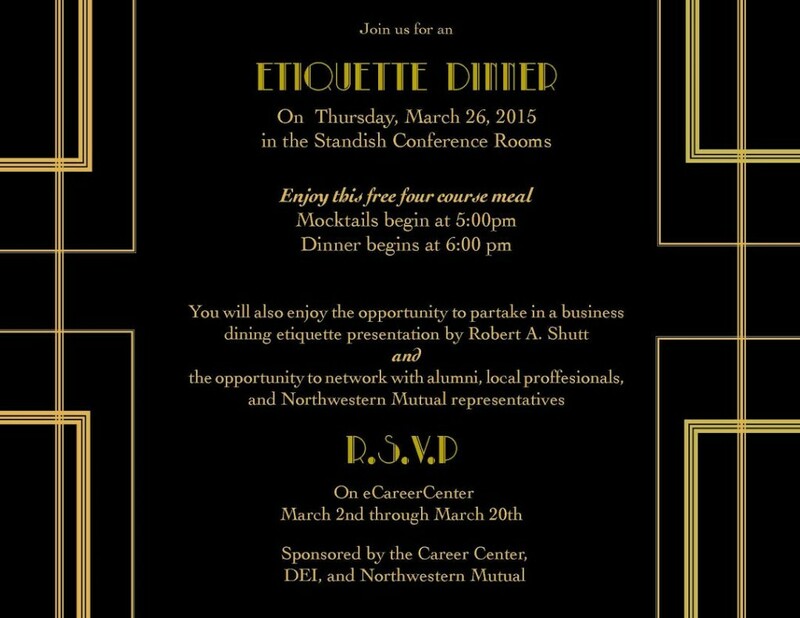 Please join us on Thursday, March 26th in the Standish Conference Rooms for a professional Etiquette Dinner. The evening will begin with mocktails at 5:00 PM and the four course meal will begin shortly after at 6:00 PM. The Etiquette Dinner is an opportunity to practice your manners and network with ‘alumni, local professionals, and Northwestern Mutual representatives. If you wish to attend, please RSVP on eCareerCenter between March 2nd and March 20th.